Do it yourself or let us do it for you! At Budget Blinds & Awnings, if you would prefer us to do the measuring, no problem! It is a free service and one we highly recommend you use. This ensures the best possible fit and the right product for your needs. However, if you are a keen DIY type, we give you all the information you need to measure and install yourself, so you can save even more money. So here are the guidelines to measuring. Remember, this is the most important step, which is why we offer our measuring service for free with all quotes. If your blinds are too big for the opening or too small and they don't fit, then you may find it has been a costly exercise if you get it wrong. So let us do the measuring for you. If you are out of town or simply want an idea on price before you get a final quote, then doing a pre-measure yourself is a great way to ensure the price quoted is the price you will pay. Remember, there are a number of things you need to look out for when measuring and installing, so the price quoted may change if there is something unforseen when we do our check measure, though this is relatively rare. If you would like your blind to sit within the window reveal, follow the measure guide pictured on the far left. Take three measurements of the width, noting the smallest measure, and three measures of the height, again noting the smallest measure. It's always worthwhile, measuring the depth of the reveal as well. This is taken of the narrowest space available. Take note of any handles etc which protrude into the reveal. 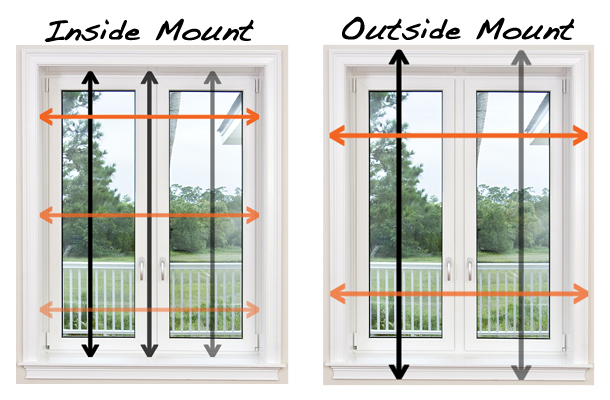 Your measure would be from that point to the face of the window frame or wall. If you want your blind to sit out on the face of the window frame, or it needs to because of the style of the window, then you need to measure the width from architrave to architrave and the height from the top of the architrave to the window sill. You can go below the window sill as shown in the picture if you wish. Three measures of each are preferred, though two will suffice for outside measures only. The most important measures, whether you want an inside/reveal fit blind or an outside/face fit blind, are taken at the very top of the window where the blind itself is going to sit in its brackets. If the measurement you provide is bigger than the available space, then potentially the blind will not fit. Always advise of the measure as width first, height second and do not make any deductions. We highly recommend a check measure by us, before ordering any blinds. Once your blinds are ordered, no changes can be made. If the order was placed based on your measurements, no refunds will be payable should the blinds not fit correctly. So you are going to install yourself. Good on you! Not only will you save money, you'll have a wonderful sense of accomplishment when you are done. The manufactures guide to installation will be provided with your product. If you would like a copy once your product has been ordered but before it is delivered, please let us know and we will make one available to you. Items you will need; A ladder, tape measure, pencil, level, drill and drill bits. Installation is often quite simple, though we do understand that sometimes, you'd rather have someone do it for you and not worry about the little details. Once your blinds or awnings have been received and checked by my office, we will contact you to book in the installation date. The amount of time required to install, will depend on how many products we are installing and the type of product.